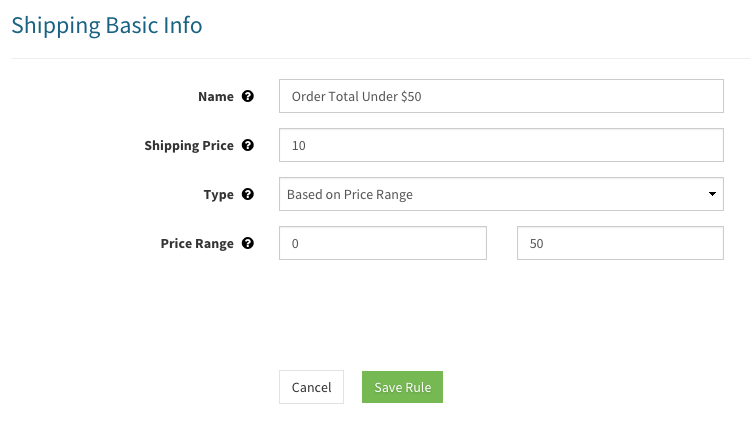 PayWhirl allows you to add shipping charges to every purchase. This can be based on the customers location or total price of the order. In this tutorial we'll cover how to charge shipping rates based on order price. This rule will add a $10 shipping charge to all order totals between $0 and $50. NOTE: If two or more shipping rules apply to a purchase the one with the more specific rule will be applied. A price range is the most specific shipping rule and will always apply as long as the customer's "shipping total" is in the specified range. You have the ability to be as specific as you want with shipping rules. Lets say you have a shipping rule set to apply on all purchases. If you create a rule for a price range, that rule will take apply to purchases in the price range instead of the more general 'on ever purchase' rule. Same goes with a location based rule. If you have a two rules, one for every purchase and one for customers in the United States, the more specific location rule will be applied.